The 9055 Love Seat by USA Premium Leather at Miskelly Furniture in the Jackson, Pearl, Madison, Ridgeland, Flowood Mississippi area. Product availability may vary. Contact us for the most current availability on this product. Fabric Content Selected leather cow hides are carefully tanned and drum dyed to the optimum levels of softness and color. Slight variations in texture and tone of the leather are characteristic of natural products and attest to the quality of genuine leather. Frame Construction The supreme quality of these pieces begins with completely solid 1 ?? corner-blocked hardwood frames, which are double-doweled and reinforced, creating maximum strength. Seat Support True 8-way hand-tied coil construction provides the highest level of leisure available. This allows springs to respond independently for balanced comfort and long spring life providing durable comfort. Padding & Ergonomics Genuine spring and fiber seat cushions provide lasting and luxurious use for years to come. Seat cushion coils are muslin wrapped with genuine down-blend pillow tops. The 9055 Collection features a timeless design that will stay with you for years to come. With construction in the USA, the collection is made with high quality using the best materials giving the furniture a long life. The collection is covered in top grain aniline leather and accented with alligator creating a statement that only gets better with age. 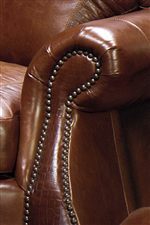 Traditional features include flared rolled arms, detailed nailhead trim and turned bun feet. The 9055 Collection adds luxury to your living room with comfort and style standing the test of time. The 9055 collection is a great option if you are looking for Traditional furniture in the Jackson, Pearl, Madison, Ridgeland, Flowood Mississippi area. 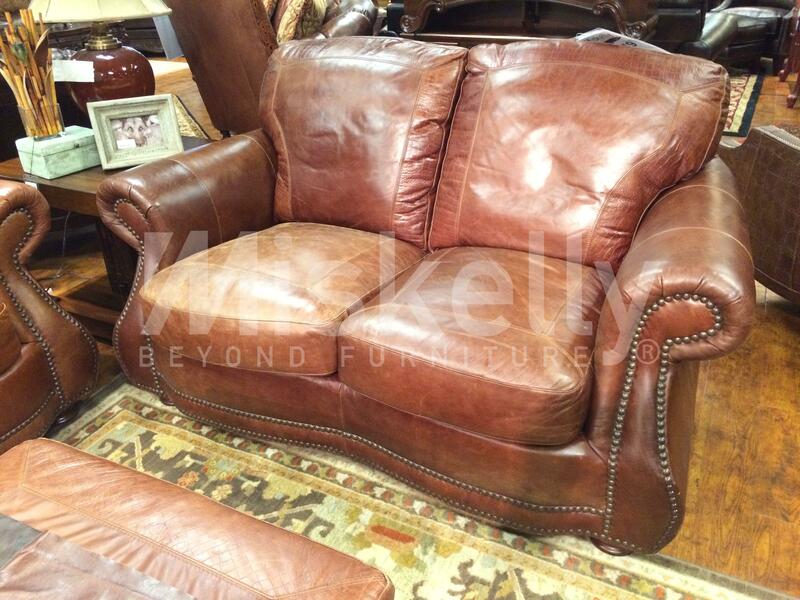 Browse other items in the 9055 collection from Miskelly Furniture in the Jackson, Pearl, Madison, Ridgeland, Flowood Mississippi area.